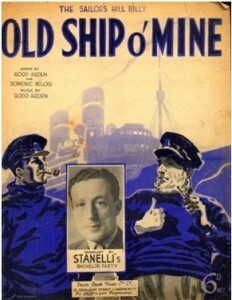 The original song “Old Ship o’ Mine” was published in London in 1935, written by Rod Arden and Domenic Pelosi, and soon passed into oral tradition. In the revival, it has been taken up by various shanty groups. I suspect that this song is better known than collectors report, and the Roud index reports a scant 3 versions, all from England, but I have heard it several times in Gloucestershire from source singers. Wells Morgan of Framilode knew the song, as did Ken Langsbury who learnt it from “Pop” Latham of Cheltenham. One day by the docks I was straying. To an old ship just in from the sea.